Maintaining proper nutrition is key to good health, but for those preparing to get pregnant, obtaining essential nutrients is of utmost importance, not only for their own sake, but also for the sake of their babies. 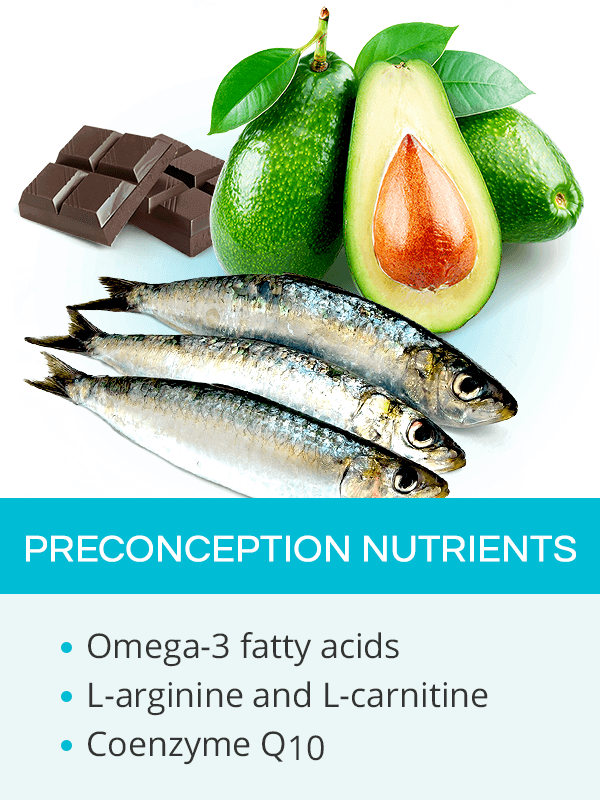 Adequate preconception nutrition has been shown to increase female fertility and improve pregnancy outcomes. As such, understanding which pre-pregnancy vitamins and minerals are key to a healthy conception will help future mothers balance their diets and complement them with the necessary supplements. 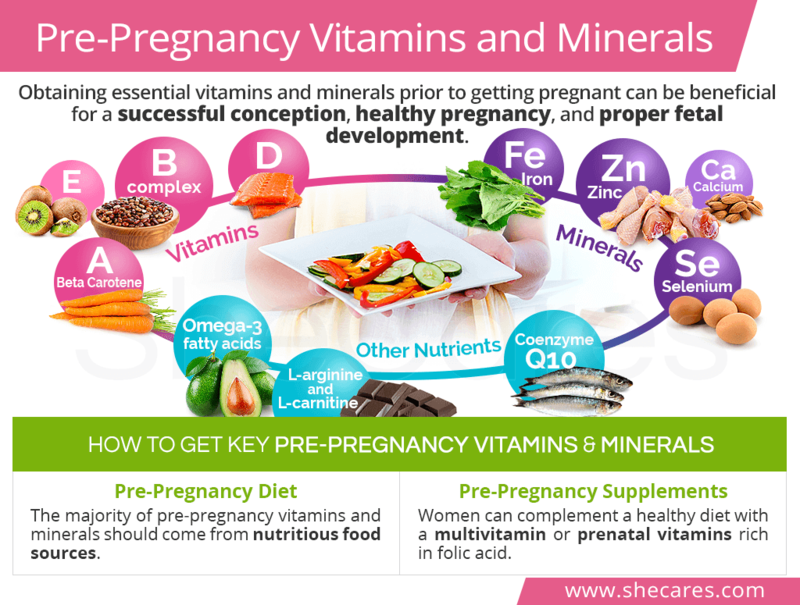 Continue reading to learn what preconception vitamins and minerals you should be paying attention to as you prepare for motherhood and how to make sure you are getting all of the nutrients you need for a successful conception, healthy pregnancy, and proper development of your baby. B vitamins are crucial before and during pregnancy, particularly B6, B9 (folate), and B12. They lower the risk of pregnancy complications and birth defects as well as help in the formation of the fetal brain, nervous system, and more. Vitamin D is required for ovarian eggs to properly mature as well as for adequate absorption of calcium. Although vitamin D can be obtained from natural sunlight, it can also be obtained from numerous food sources. Beta carotene found in food is converted in the body into vitamin A. It has strong antioxidant properties, thanks to which helps it prevent DNA damage caused by free radicals.It also aids in tissue repair after childbirth. Vitamin E is an antioxidant that have been shown to increase pregnancy rates in women using assisted reproductive technologies (ARTs). It also protects the cells from free radical damage and strengthens the immune system. Vitamin C is needed before pregnancy to make collagen, which builds skin, bones, and cartilage. It has antioxidant properties helpful in boosting immunity and has been found to improve iron absorption in the body as well. Zinc assists in maintaining estrogen and progesterone balance and regular menstruation as well as the maturation of the eggs in the ovaries and their transport through the fallopian tubes. Iron is crucial in transporting oxygenated blood to reproductive organs to ensure proper egg maturation and prevent irregular periods or ovulation problems arising from its shortage. Selenium has been found to have antioxidant properties that protect the body cells from free radicals, thus decreasing the risk of chromosomal abnormalities causing birth defects and miscarriages. Calcium requirements greatly increase during pregnancy as it is needed to build the baby's teeth, heart, bones, muscles, and nervous system. Proper calcium levels can also protect women from developing hypertension or preeclampsia during pregnancy. Iodine is needed for proper thyroid hormone production. It also aids in the development of the baby's nervous system. Iodine deficiency has been associated with increased rates of infertility and miscarriages. Coenzyme Q10 assists in energy production and utilization within the egg cells. As such, it helps optimize their maturation and quality before they are released on the day of ovulation. L-arginine and L-carnitine are key to maintaining a healthy female reproductive system by stimulating blood flow to the uterus and other organs. These amino acids can worsen the symptoms of some sexually transmitted diseases (SDTs), like herpes. Omega-3 fatty acids improve a woman's fertility by reducing inflammation in the body and increasing blood flow to reproductive organs. It has also shown to reduce the risk of premature birth and increase success rates of in vitro fertilization (IVF). Choline is an important nutrient in fetal development, particularly the baby's brain, which affects his or her future cognitive abilities. Also, low choline levels in pregnancy can increase the risk of neural tube defects. 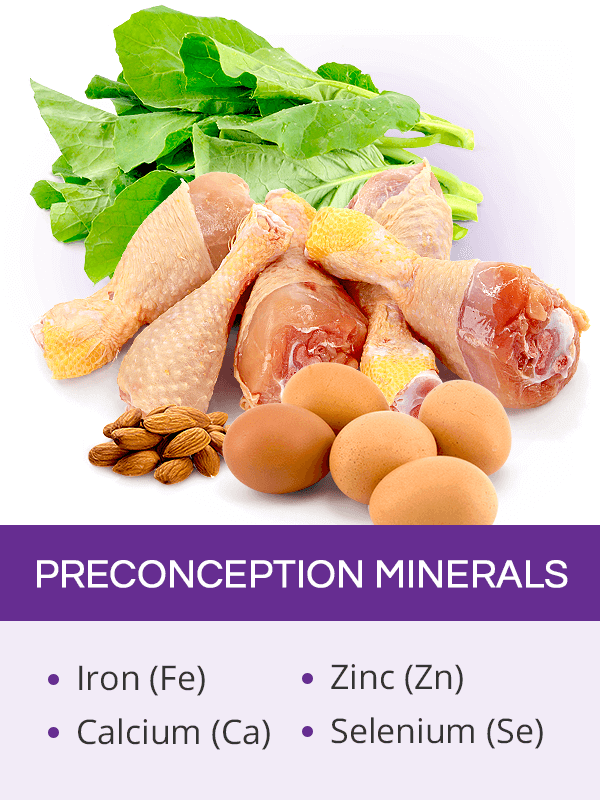 The main objective of preconception nutrition is to resolve nutritional deficiencies and hormonal imbalance in order to improve overall health, boost fertility, and prepare the body for nurturing a human being. As previously mentioned, the majority of essential nutrients needed to prepare a woman's body for getting pregnant should come from food. A balanced and nutrient-rich preconception diet not only promotes hormonal balance to regulate menstrual cycles and ovulation, but also helps women achieve a safe weight in order to get pregnant without problems and go through pregnancy without complications. Following a fertility diet is quite popular among aspiring mothers as it helps them obtain all preconception vitamins and minerals they need. It consists of a varied meal plan composed of healthy fats (avocado, olive oil, nuts), lean protein (preferably plant-based: beans, nuts, seeds), and complex carbohydrates (whole grains, fruits, vegetables). Supplementing with preconception vitamins and minerals should complement a healthy diet, not be used in its stead. Because not all supplements are safe to be continued throughout pregnancy, it is recommended to first consult a doctor. Women who plan their pregnancy ahead of time often take advantage of various fertility vitamins and supplements to boost their chances of getting pregnant. Some, out of convenience, prefer to take a multivitamin three to six months prior to conceiving. Although prenatal vitamins rich in folic acid are technically recommended to be taken as soon as a woman's pregnancy is confirmed, numerous studies have found that taking folic acid before pregnancy can decrease the risk of miscarriage and birth defects. It is a natural impulse among women planning to get pregnant to do all they can to optimize their preconception nutrition so that they get pregnant more easily and ensure that their babies will have all nutrients necessary for their growth. However, with such an abundance of supplements and recommendations, trying to figure out which vitamins to take before pregnancy might be a bit confusing. 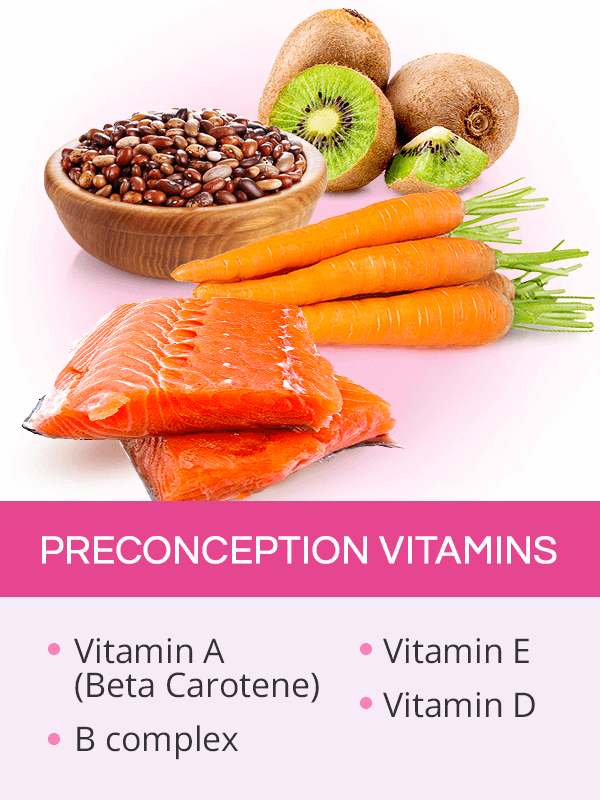 Unless there are specific nutritional deficiencies or a hormonal imbalance that calls for more customized approaches, women are advised to obtain the majority of key pre-pregnancy vitamins and minerals, such as vitamin B complex, zinc, iron, or omega-3 fatty acids, from food. Then, complementing a balanced and nutritious diet with a multivitamin or prenatal vitamins rich in folic acid can prepare a woman for successful conception and a healthy pregnancy.